It was with a sense of anticipation that we entered through the doors of the Ballroom in the Sandton Convention Centre. We knew we were expecting something – we just didn’t yet know what. The whole setup of the event immediately transported you from your framework of what-happened-at-work-today into a world of amber liquid heaven. In the background you could hear the famous Richelieu tune being played on accordion, and the rap-tap-tap rhythm of the master cooper doing a barrel-making demonstration. All around it’s just a mingling of people from all backgrounds, drinking and enjoying and talking, all facilitated by this featured liquor of the evening – brandy. We started the night a bit overwhelmed with choice. You receive 15 brandy tasting coupons, 3 cocktail coupons and 2 premium coffee coupons upon entering. Also a brochure showcasing the 50 or so premium brands up for taste. Giving such a broad choice to someone who knows not the first thing about brandy (except that it’s made from wine) leads to a bit of analysis paralysis. “Should we try this one?” “I don’t know” “What if it’s bad” “I don’t know” “Do you think we should start with this one?” “Never heard of it…”. Okay, so we did the next best thing, and we started with coffee – that at least got some gears turning. We then figured that we had enough coupons so that we couldn’t really make a mistake, and so we began. Now, full disclosure, we tasted more brandies than this article can accommodate, so I’ll only mention those of note. The first real showstopper we tasted was the Van Ryn’s 20 year old. What a beauty. Remember, we come from the severely skewed and ignorant South African point of view that Richelieu and Coke is brandy. Oh, how wrong can you be. The Van Ryn’s 20 year old brandy is a masterpiece. It completely took us by surprise, as we were expecting the harshness or even acridity that we associated with (cheap) brandy. It starts with soft fruity and spicy aromas on the nose, perhaps reminding of dried fruit. The taste is just exquisite. Very smooth drink, soft mouth feel. Complex tastes of spiciness and traces of some woody oak. What amazed us was the complexity of the flavours, something that kept on developing and evolving as we let the brandy warm up in our hands, slowly drinking in the perfection crafted over two decades. We spent a bit of time admiring the Van Ryn’s 30 year old Aura, a bottle so exclusive it was only available on display. We started floating around the venue, a little more in tune with what the evening is about now that we have sampled the real deal. We made our way over the Porsche exhibition, spending a few minutes sitting in the new Panamera, just dreaming moonshot dreams, while slowly sipping the Van Ryn. It honestly just kept getting better, slowly releasing more of its treasured aromas. But, 25ml of an excellent brandy does not the evening make, and pretty soon our snifters were empty and calling for more. The problem was now to follow up the exquisite Van Ryn with something that didn’t disappoint. And that’s when we met our new friend, Conrad Louw (@ConradHLouw). Conrad was at the SA Brandy Foundation bar, roughly situated in the middle of the venue. Our eyes drifted towards their selection of brandies, and perhaps owing to our own penchants for unique and artisanal products, or perhaps drawn in by Conrad’s friendliness, we approached. Where the rest of the brandies on taste that evening was mostly from big commercial brands, the line-up Conrad had was off the beaten path. 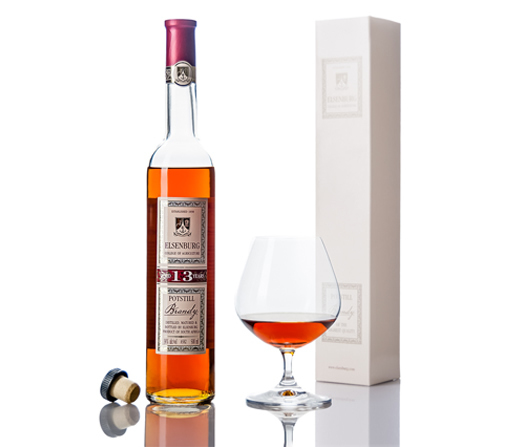 The story of the evening for me turned out to be the Elsenburg 13 year brandy. What else can be expected from a brandy so rare that it can only be tasted, not bought? The Elsenburg Agricultural Training Institute bottled this brandy in 2013. All the production processes of this fantastic brandy is performed by final year Cellar Technology student. Only a very limited quantity of this brandy was produced, and it is not commercially available. The Elsenburg is so smooth and easy-drinking, that the first sip slips down before you really pay attention to the taste. But when you do, oh, what a pleasure. The aroma reminds of cinnamon pancakes made by your mother, hints of spiciness prevailing. The smooth and soft taste calls up summer fruits like peaches and apricots. It has a wonderful aftertaste, constantly reminding you to take another sip. We drank it neat in our balloon glasses, and cannot imagine it being enjoyed any other way. Too much complexity lies in this liquid for it to be lost in a mixture. We were sort of stunned by this drink. Conrad entertained us some more, letting us sample some more fine brandies. But all the time our thoughts returned to the Elsenburg. Truly the story of the evening for us. To quote Conrad: “To think, the people that made this weren’t even paid to do it!” However, when asked what his favourite brandy of the evening was, he gave us a rather surprising answer – KWV’s Cognac. “KWV’s Cognac?” Exactly what we asked. Conrad explained that a gentleman over at the KWV stand presented him with their new XO Cognac, making its world premiere that night. He told us to go find some for ourselves, but if we fail to do so, we’re welcome to have a taste from his. So, naturally, of we went to the KWV stand. There we found this elusive cognac, and Paedar Hegarty from KWV bestowed us with the honour of having a taste. Now, there is so much more to this cognac and its story than this article can do justice, but I guess everyone will have to wait until the official launch, which we understand will be sometime during September. Short summary is that KWV in collaboration with the French House of Charpentier, located in the Cognac region of France, blended a masterful Cognac from the best Charpentier had to offer. The end result is this exclusive drink – the KWV Héritage XO Cognac. The XO designates “extra old”, and this specific cognac is a blend of cognacs between 12 and 30 years. The KWV cognac has a wonderful aroma. The nose has a lovely fruity flavour, perhaps also reminding of those cinnamon pancakes mentioned earlier. It tasted of dark chocolate and good coffee. The lingering aftertaste reminds of citrus. The only thing missing was a cigar and a leather chair. For this cognac KWV designed an interesting logo that appears on the bottle – two keys interlinked. The story behind this is that it symbolizes their cross-continental alliance with Charpentier, but also honours an age old Cognac tradition, where legend has it that one key to the cellar is kept by the Cellar Master and the other by the Master Distiller. Our entire opinion of brandy was changed on this evening. Blame it on South African predecessors that created the brandy and coke generation. Blame it on personal ignorance. But we are grateful for getting the opportunity to learn about something that I obviously knew nothing about. Thank you Joburg Style Magazine (@joburgstyle) for setting us up with tickets. Of course, just before we left and called it a night, we quickly went back to see Conrad. He immediately knew what we were after, and he poured us each some more of that delicious Elsenburg. What a man. Smell your brandy. Taste your brandy. But most importantly SAVOUR your brandy. Drink it neat, sit up straight and pay attention. Feel the burn on your tongue. Feel the warmth spreading down your throat. Sip it, swirling the amber liquid round your mouth. Appreciate the flavours, pleasant and unpleasant. Take notes. Don’t just gulp it down. Drink it slowly, let the flavours develop in your hand, sit on a couch discussing life with a friend, while drinking life’s essence. I used to think that whisky was the thinking man’s drink. I was wrong. Brandy is as much an intellectual drink as whisky. Truly something for the discerning gentleman. Thanks to the exceptional effort by the SA Brandy Foundation we are now budding brandy connoisseurs as well. May there be many more of these Fine Brandy Fusion events, and may we have the honour of attending all of them.